Click the image below to flip through our Games Flyer! Games and Puzzles are an important part of learning as well as entertainment and fun. At Vernon Teach and Learn Ltd, we carry a large selection of traditional games and educational games for all that want to improve their knowledge. 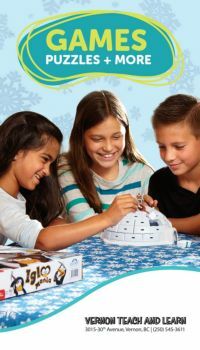 For those who are looking for popular games to play during the holidays or just to entertain friends or kids for the day or evening, we have an excellent variety to choose from.